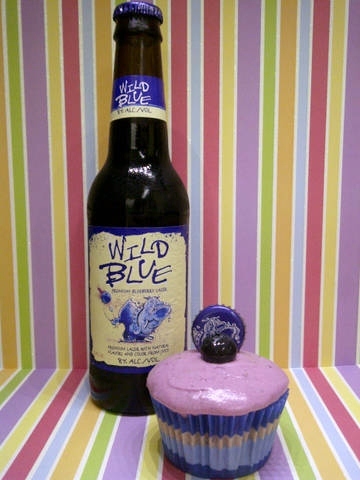 The Blue-Beery Cupcake Gone WILD! I am a HUGE fan of Wild Blue Blueberry lager. It’s yeasty, sweet, smooth and incorporates natural blueberry flavors and juice. Plus, the alcohol abv is a whopping 8% per 12-ounce! Not bad for a lager. The more I dive into the cupcake world, the more I try to think of ways to separate myself from every other super-sweet, dainty, cutesy-wootsy cupcake shop. So here comes my Blue-Beery cupcake with her bad self. She’s made with a fresh blueberry compote, Wild Blue blueberry lager and a blueberry goat cheese frosting. No fondant. No fancy frosting decorations. No short cuts on ingredients. Made by hand every step of the way because that is what LRBK is all about. Check out my “LRBK Cupcake” tab for more mouthwatering cupcakes that are available.